This is LeBron James last night just after he lead the Cleveland Cavaliers to a 93-89 victory over the Golden State Warriors in Game Seven of the 2016 NBA Championship. 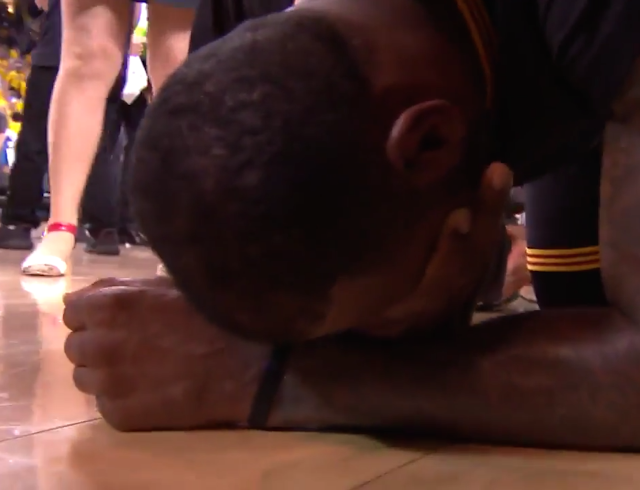 LeBron collapsed to the floor and began crying tears of joy. In this image we can see him covering his face with his right hand. The vast majority of the time when people cover their eyes in scenarios similar to this - it's NOT to prevent people from seeing their tears - but it's because they are in a sudden and deep sense of disbelief. Their "logical brain" knows what has transpired - but their "emotional brain" has not yet caught up. Thus this sudden facial/eye covering is a nonverbal sign of emotional processing. If we could somehow watch all Cleveland fans, very many of them would have a similar hand-face body language configuration. Therefore it's NOT a requirement that one be directly involved in the event - but seeing or hearing about it - even via second or third hand information will often evoke a similar response. It is also just as common (if not more so) when it's bad news that's being witness/delivered. Fascinatingly, those who display this nonverbal signal for another person's joy or tragedy - will also have higher empathy quotients (as well as greater compassion and affection). Nonverbal Communication Analysis No. 3554: Paul Allen, Steph Curry and the "Slack Jaw"